Before the first bridge was built at Potsdam in 1809, the Racquette was crossed by a raft just below the falls. It was usually tied to the west bank for that was where the few people lived. People coming from the east had to call across and someone would go across for them. In 1809, the first bridge was built on the side of the present one. This one lasted until 1830 when a second one was built which lasted until 1849. The new one built in 1850 lasted until 1920. 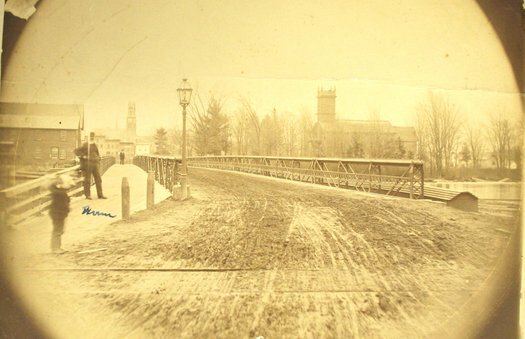 This is the iron bridge many of us remember; a picture of it is in the Museum collection. 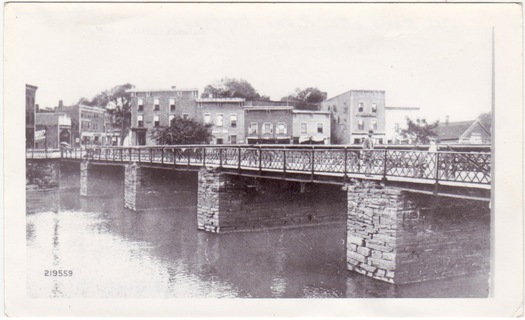 The present bridges were built in 1920. In 1810, Mr. Raymond erected a building on Union Street for a school and place of worship. Church services were first held in Mr. Raymond’s own home. First, for his own family and gradually increasing in members as friends asked to join the Raymonds. The first teacher-minister was engaged in January 1811, a Mr. James Johnson of Lynn, Massachusetts, a graduate of Harvard. The two original letters written by B. Raymond to hire Mr. Johnson are framed and in the Museum. 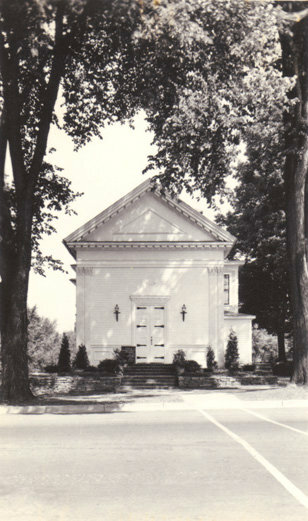 In 1811, when services were first held in the little new building, the group called themselves ‘St. Paul’s Society’. Later, this society having been disorganized, ‘Trinity Society’ was formed: John C. Clarkson, Horace Allen, Forrest Morgan, Ezra Barnum, Samuel Partridge and Daniel Shaw, trustees. The name was considered ‘too stylish’ for a group of Puritans, so the name was changed to ‘The First Presbyterian Society’ on December 16, 1820. Azel Lyman, Sewall Raymond, and Forrest Morgan were trustees. In 1820, the Presbyterians decided to build a white wooden church on the Gospel Lot at a cost of $4,500. This was in the center of the Park where Clarkson’s Snell Hall is today. The frame was up on July 1st, 1821. The raising was a great event. An ample lunch was provided by the people of the church with plenty of good liquor to wash it down. Total abstinence was not yet considered a religious virtue. The following story was related by the Rev. George R. Sawyer to William H. Wallace Esq. right after the erection of the single tall timber. Ansel Paine mounted to the top, more than 100 feet high, stood erect on the end of the timber, swung a whiskey bottle around his head and then flung it to the ground where it landed unbroken in the mud. He then, for a moment, reversed his position, stood on his head on the end of the single timber and finally descended to earth. 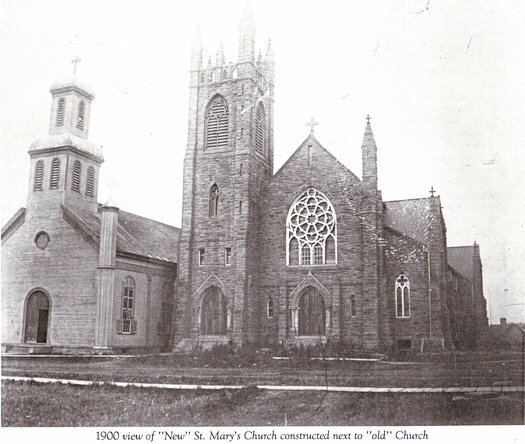 The white church was dedicated in February 1822 and used until 1853 when it was replaced by a brick church at a cost of $10,000. In 1867, this was sold to the State for $10,000 and incorporated in the new Potsdam Normal School, forming the central part. 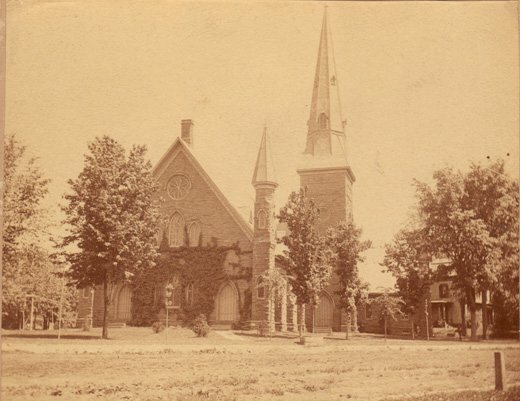 In 1868, the present church of Potsdam sandstone, Elm Street and Lawrence Avenue, was started. It was completed in 1872 at a cost of $47,000. 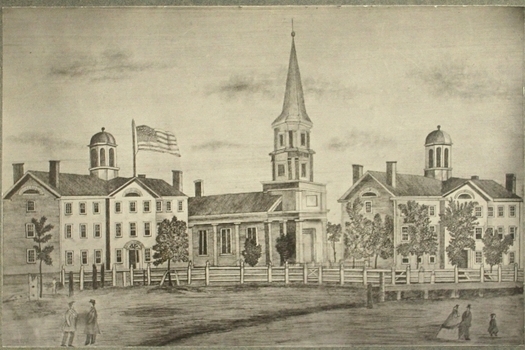 The First Methodist Church was organized in 1821 and the white wooden church built on the site of the present Fire Station. This served as the church until 1860 when it was sold to the village for a firemen’s hall. 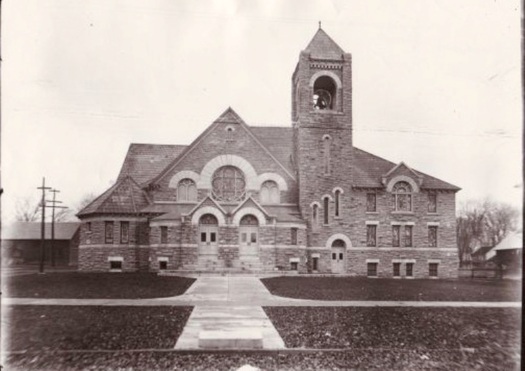 The steeple removed, the building remodeled and served until 1913 when the present building of brick was built. Incidentally, the Fire Department was organized in 1823 and incorporated in 1831. In 1860, the Methodists erected their second church, a brick one on the site of the present church. The parsonage was built in 1882. This church became too small and in 1903 the present structure of Gouverneur marble was built. The Baptist Church was organized January 9, 1824. The present church is the original building, with improvements being made from time to time. It was built in 1858 at a cost of $5,000. It was of wood painted gray. It was improved in 1875 at a cost of $2,500. The parsonage was built between 1875 and 1878. The wooden structure has been covered with asbestos shingles. 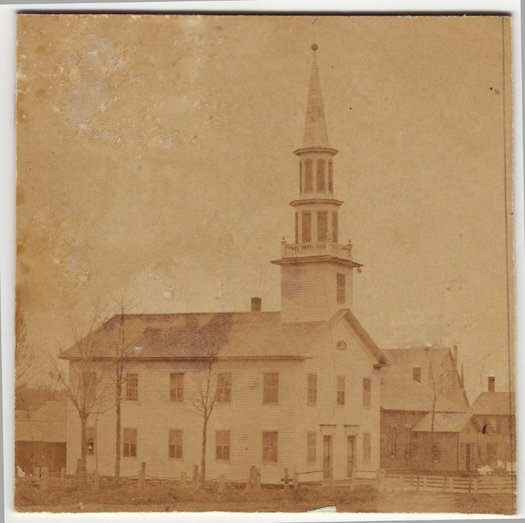 The Universalist Church was incorporated in October 2, 1825. 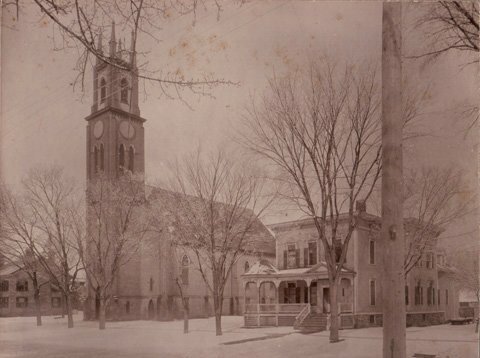 The old white church was built in 1835 (pictured left) and replaced by the church of Potsdam sandstone in 1876 at a cost of $12,000 (pictured right). 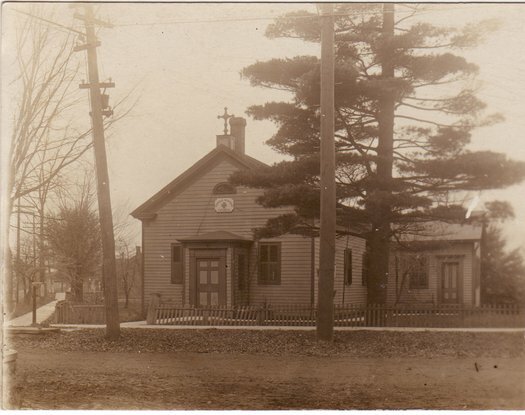 Services were held until 1933 when a few remaining members voted to give the property to the village, the building for a library, the land between the church and town hall to be part of the new Civic Center. The church was remodeled in 1934 when the Civic Center was built and the library moved from Market Street location in 1935. The Roman Catholic Church first held services in 1832. The first mass was said in the house of a Mr. Burk on Pierrepont Avenue. In 1841, a dwelling house (12 Clinton Street) to which the name “St. Mary’s” was given was purchased and used as a church. 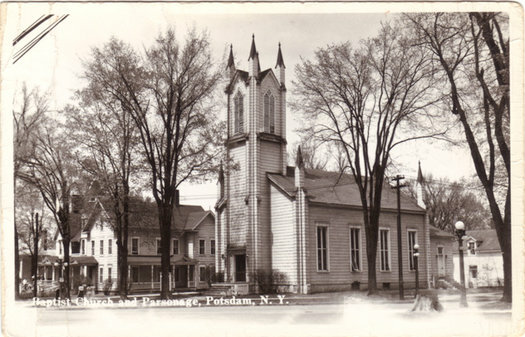 In 1857, Potsdam became an independent parish and in 1859 the large gray wooden church was built at the corner of Lawrence Avenue and Clinton Street. 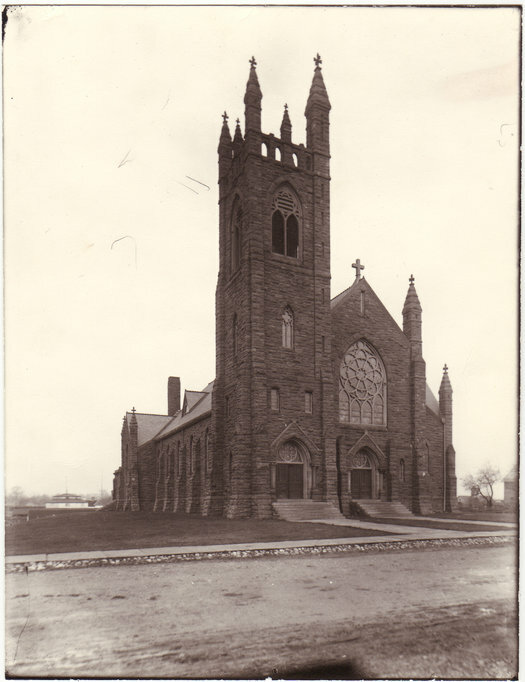 The present sandstone church was built in 1898, dedicated December 18, 1900; redecorated and opened December 17, 1950. The brick parsonage was built in 1866 and the present Rectory in 1918-19. The first resident priest was Rev. James Keeveny about 1856. Trinity Church was built in 1835. It was modeled after old Trinity Church in New York which the Clarksons had attended. John C. Clarkson and Augustus L. Clarkson were wardens. Vestrymen were David L. Clarkson, Zenas Clark, Theodore Clark, Myron C. Munson, Noble Strong Elderkin, Samuel Partridge, Frederick Miller Jr. and Aaron T. Hopkins. The church was built of sandstone in the old slab and binder style. Only the sides of the old church remain in the present edifice. The recessed chancel was built in 1858. The chapel of Trinity Church was erected in memory of Levinus Clarkson and his father with $10,000 left by Mrs. Elizabeth Clarkson. The new facade was given by T.S. Clarkson and his sisters and dedicated on February 26, 1886. In 1837, the Catholic Apostolic Church was organized. 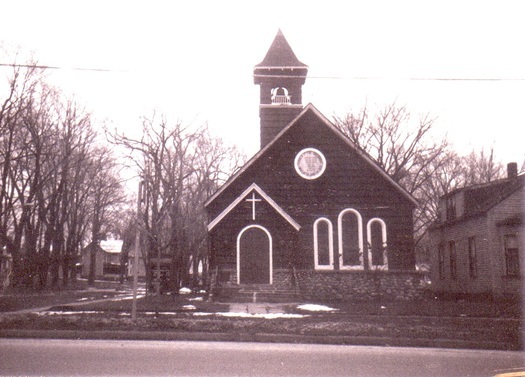 The church stood next to Mr. Dona’s house, corner Maple Street and Pine Street where the gas station now is. 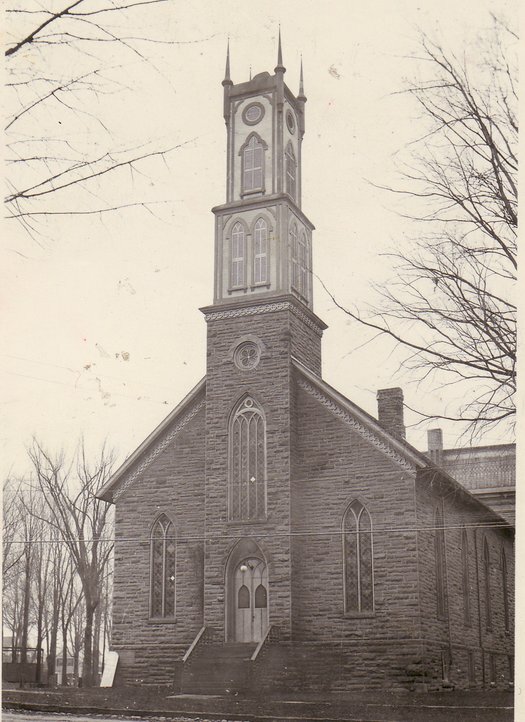 The church was built in 1843, enlarged in 1874, and torn down sometime after December 1920 when the church was given up. 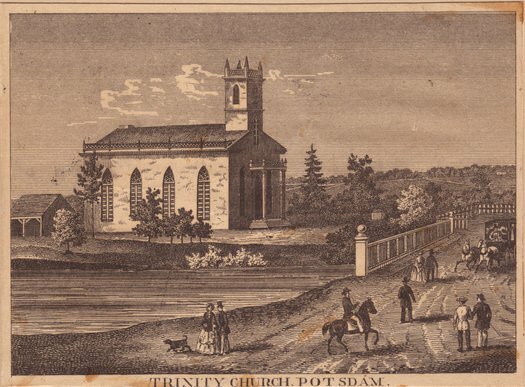 A few families of this church still live in Potsdam including Herbert Bicknell and Bernetta Seeley Elliott. David Lewis invited two evangelists here in 1837 when the church was formed. W.J. Seeley and W.F.B. Seeley were prominent members. Noah Perrin was Chief Elder and acting Pastor until his death in 1876. The Christian Science Church was organized in 1891. The first services were in homes, including the home of M.V.B. Ives from 1896 to 1899 and the home of Miss Julie Ettie Crane from 1899 until 1901. In 1901, the church rented the Dayton House, corner Main and Pierrepont. It had Reading Rooms from 1901 to 1919 over Stone’s Gallery, corner Market and Munson Streets, where the National Grid office is now. The church purchased the Dayton House in 1919 and held its first service September 7, 1919. 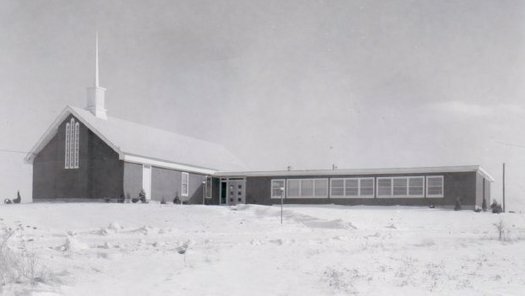 In 1946, the present church was purchased from Julie Walling and the first service held on Thanksgiving Day, 1947. Three new churches have made their appearance in Potsdam during the past 20 years. The Church of the Nazarene, corner Market and Cottage Streets, was built in 1951 by Mose LaValley of Potsdam. Mr. LaValley was seriously ill and made a promise that if he got well he “would repay God by building a church”. He constructed the church entirely by himself and donated it for the use of the Nazarenes. Services began June 10, 1951. 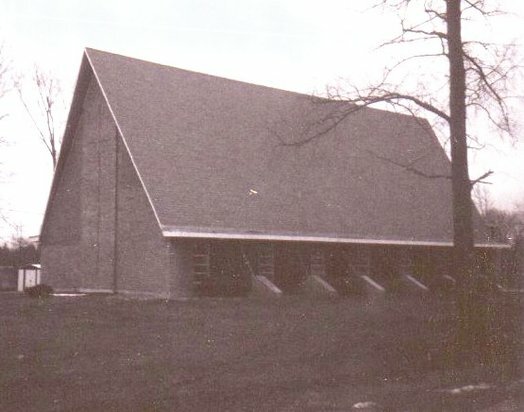 In 1963, the Emmanuel Baptist Church was built on the May Road, near Haggarty Road. The first services were held in the spring of 1964. The newest church in Potsdam is the Gloria Dei Lutheran Church, located on outer Elm Street. It was built in 1967-68 and was dedicated December 8, 1968. Let us now return to the early 1800s and trace the growth of our schools from the “Old Academy” on Union Street built in 1811. 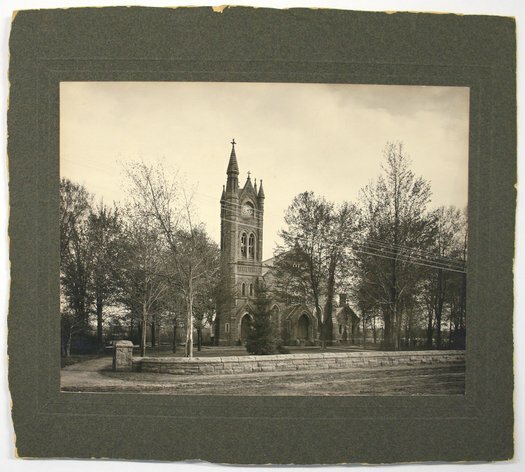 By 1825, this building became too small and the first building of the St. Lawrence Academy was built on the Literature Lot north of the white wooden Presbyterian Church. This was of sandstone, the slab and binder type of mason work. 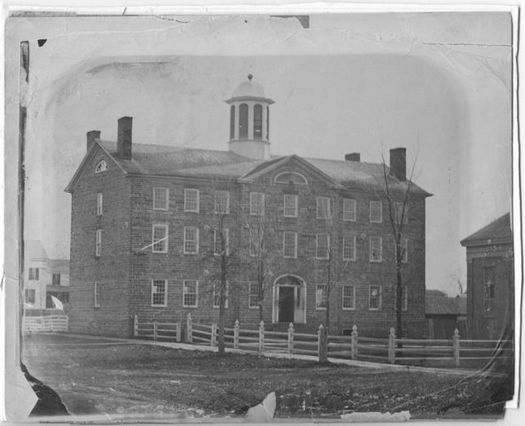 Ten years later, in 1835, the South Building of the Academy was built. This building was used as teacher’s training. It is recorded in history that no town showed more energy or industry in promoting improvements than Potsdam. 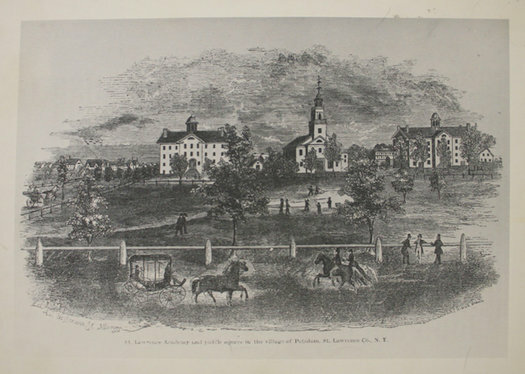 When the State decided to establish a Normal School in this area, Potsdam was chosen as the site because of the fine record the St. Lawrence Academy had made in teacher training. The Academy buildings were sold to the state. The first Normal School was built in 1867, and rebuilt in 1917. The Normal School became Potsdam State Teachers College in 1942 and the college moved to its Pierrepont Avenue campus in 1948 and that same year became part of the State University system. The Normal School building on Park Street was sold to Clarkson College and today houses the administration and classrooms. 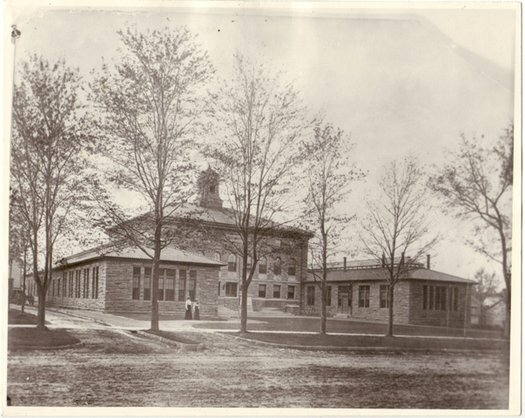 Clarkson College was founded in 1896 by Miss Elizabeth, Miss Frederica, and Miss Levinia Clarkson, in memory of their brother, Thomas S. Clarkson, who was killed in a quarry accident in 1894. 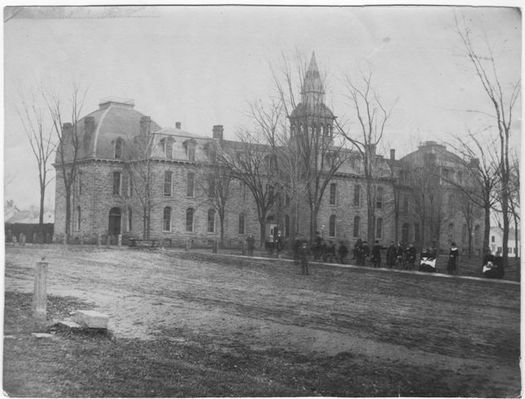 The college’s first building “Old Main” was built of Potsdam sandstone in 1896. The college expanded to the Clarkson estate on Maple Street in 1956 and has also constructed a number of new facilities on Main Street. Articles about the local elementary and secondary schools written by Grace and Ethel French and about the St. Lawrence Academy written by me are on file in the Museum.